As many as 70% of companies will adopt at least one form of AI by 2030, according to a new study. The research also found that Artificial Intelligence could contribute up to 1.2% additional annual GDP growth for at least the next decade, though significant regional, organisational and skill gaps will need to be addressed in order to see the economic potential realised in its entirety. The McKinsey Global Institute looked at five broad categories of Artificial Intelligence (AI) to build a model of what the future economy might look like, thanks to the impact of the new technology. Computer vision, natural language, virtual assistants, robotic process automation, and advanced machine learning were weighed up, as companies will likely use these tools to varying degrees. The institute expects seven in every 10 companies to adopt at least one form of AI by 2030, in the race to benefit from its capacity for innovation, and to outflank competitors. To that end, the researchers suggested that rapid adoption of AI could present firms operating in crowded fields with a major opportunity to pull away from their rivals. 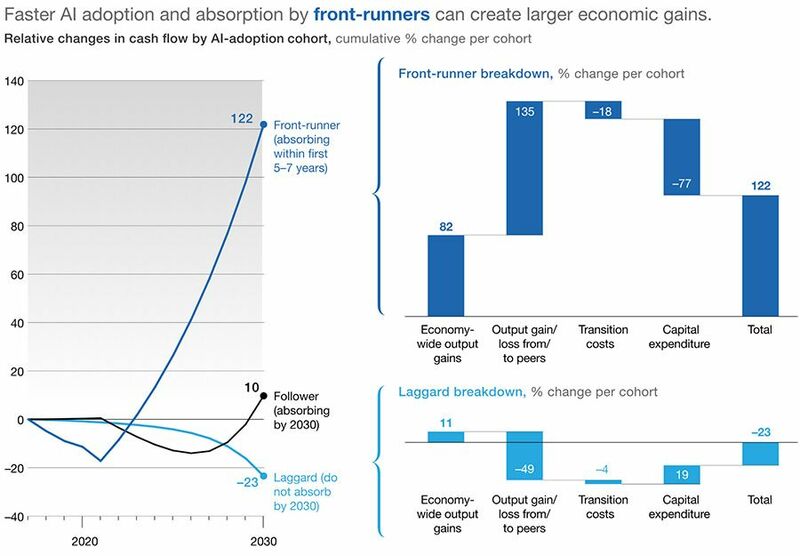 McKinsey’s analysts found that it could be possible that AI technologies could lead to a performance gap between front-runners, or companies that fully absorb AI tools across their enterprises over the next five to seven years, and followers, who absorb by 2030, let alone and non-adopters, who will not adopt AI technologies at all, or will not fully absorb them in their enterprises by 2030. Demonstrating just how fatal a mistake this could be, the institute’s model suggested that leaders on AI adoption could expect cumulative change per company could be as much as 122%, compared to just 10% among followers, or -23% among the non-adopters. While McKinsey’s paper concedes that the impact of AI might not be instant, or indeed linear, it is likely to build up at an accelerating pace over time. While front-runners will have to bear with some initial issues, including transition cost growth of 18%, and increases in capital expenditure of as much as 77%, they will benefit from boosting their economy-wide output gains by 82%, along with an overall output gain by 135%. Interpreting the “slow burn” pattern of impact as a sign the effect of AI will be limited would be a big mistake, the report suggests, as the eventual cumulative gap between adopters and non-adopters shows. The size of benefits for those who move early into these technologies will build up in later years at the expense of firms with limited or no adoption, who were keen to save in the short term on the substantial costs and investment associated with learning and deploying these technologies. Such “laggards”, as termed by the report’s authors, will likely only see 11% economy-wide output gains, while losing some 49% in overall output gain. At the same time, the transition expenditure levels at such firms, which avoiding AI supposedly would lead to savings in, will actually rise by 4% by 2030. The paper suggests that AI has the overall potential to deliver additional global economic activity of around $13 trillion by 2030, or a net impact of 16% higher cumulative GDP, when compared to today. This is also 15% higher than the impact which the researchers expect to have been realised by 2023. 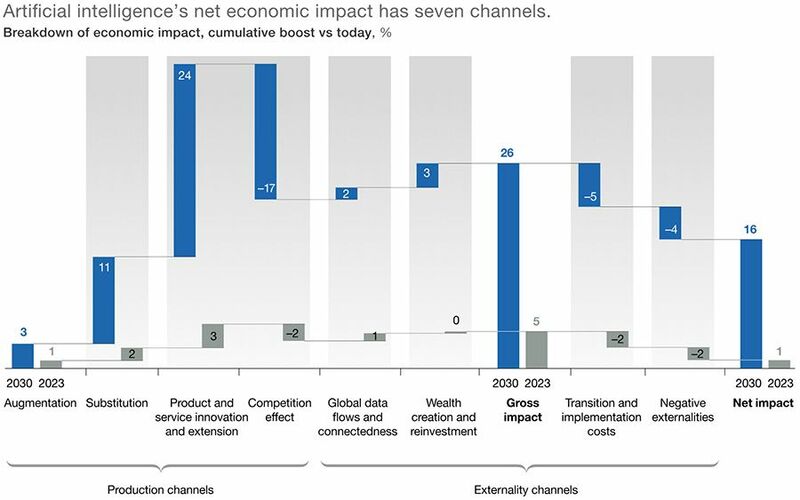 By 2030, the largest benefit AI is expected to have yielded is in product and service innovation and extension. Compared to today, AI could enable as much as a 24% improvement in this regard, as the technology could take on repetitive tasks and free human labour up for more creative, or value adding work, as well as making businesses more able to meet rising demand without increasing staff sizes. While some negative externalities inevitable with any new technology, and the previously mentioned implementation costs will reduce the gross impact of a 24% GDP boost, the positive boost AI could provide economically still vastly outweighs those problems. These benefits are not likely to be uniform, however, and one major issue highlighted in the report was that they could end up entrenching a divide between haves and have-nots. Leading AI countries could capture an additional 20% to 25% in net economic benefits, compared with today, while developing countries might capture only about 5% to 15%. In developing countries, it is more proportionally costly to implement AI solutions, while wages are lower, the benefits of substituting labour with technology yield a smaller economic benefit. Taking these economies as isolated internalised markets would suggest this is not such a problem, but when contrasting the potential productivity yields with the need to compete in an internationalised market, the issue becomes more pronounced.